Is the Muscle lifting program painful? Not at all - you will feel the muscles around your face, neck, forehead and above your eyes contract and relax throughout the muscle lifting programme. It will as if your face has been to the gym and had a good workout. What does the Endomoligie Facial Treatment for the Skin feel like? 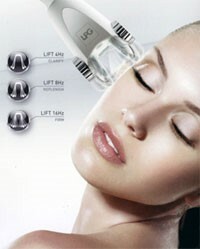 The Second program is the Endomologie Facial System which works deep within the skin tissues. Most clients have described this as a very tiny gentle Hoover gliding all over the face and neck which is a very relaxing and enjoyable experience. You will start to see results after the first treatment and will notice a lifting of the skin on the whole face and eye area and a contouring of the jowls and jaw line even after your first treatment You will also notice a brighter, smoother complexion. As the treatments progress the results with become even more noticeable as the appearance of the face and neck areas lift a little higher and feel tighter with every treatment throughout your course. You will also notice the texture and tone of your skin improves after each treatment. You are more than welcome to telephone and book a treatment or a free private consultation where we can discuss your specific requirements in more detail and explain in more detail what the Non-surgical two in one treatment can do for you. All treatments are provided in a private environment on a one-to-one basis.